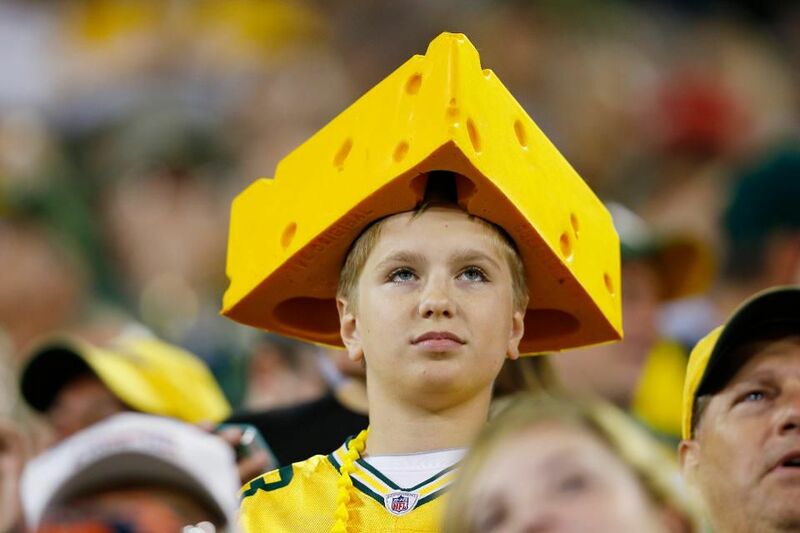 Wisconsin's Big Public Pension Cheese? 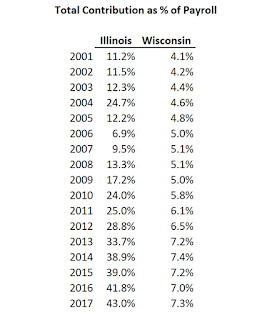 To parapharase Horace Greeley in his Manifest Destiny exhortation, but for those seeking out well-funded public pension plans, it's time to go north -- northwards from Illinois, that is, to the greener pastures of the Wisconsin Retirement System. 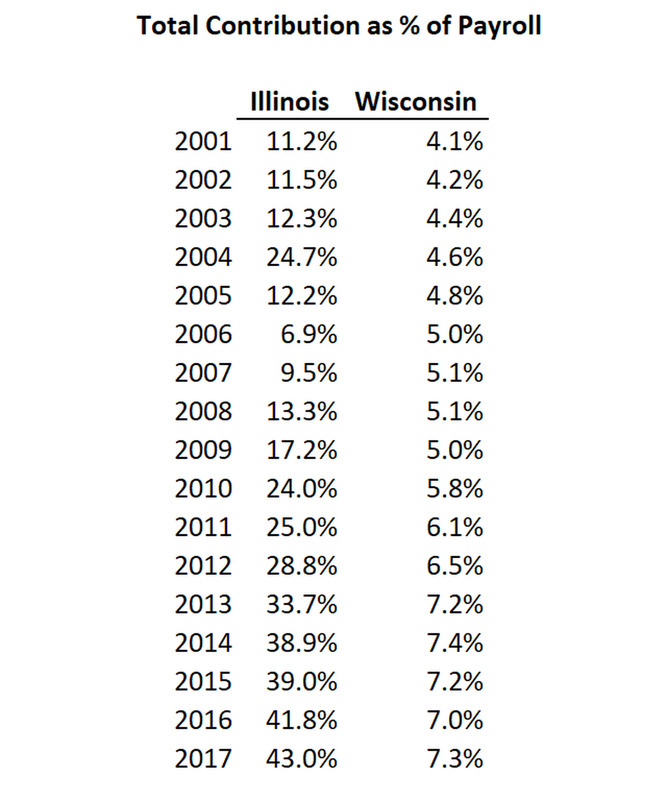 To be sure, the scale required for Illinois' contributions makes interpreting Wisconsin's contributions difficult. 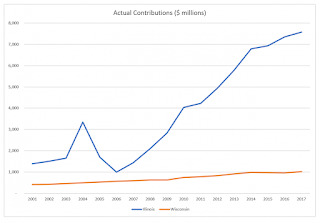 For reference, Illinois' contributions increased from $1.4 billion in 2001 to $7.6 billion in 2017, a 450% increase. 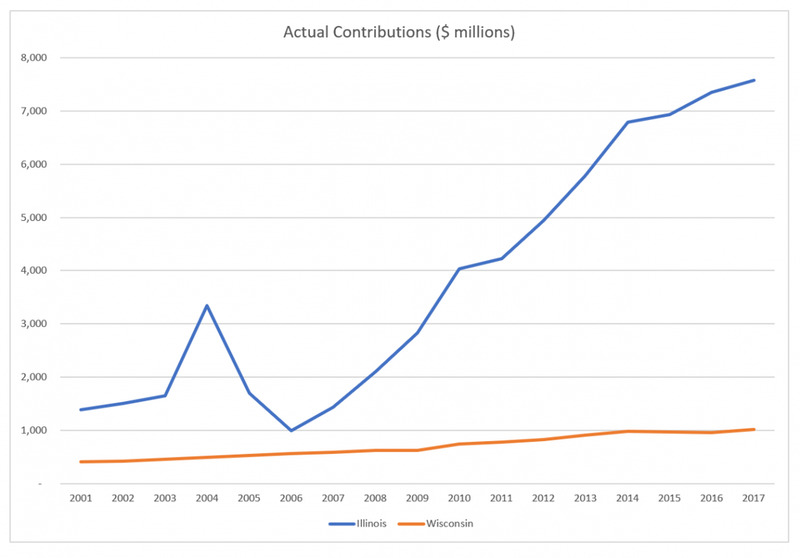 Wisconsin's contributions increased from $411 million to $1.0 billion in the same time frame, an increase of 150%. The Public Plans Data site also provides payroll data, which means we can view change over time in the contributions as a percentage of total payroll. That's easier seen as a table (click on image). So what is the secret sauce to Wisconsin's full funding? The much larger piece of the explanation, though, is this: Wisconsin's public pension system, unique among not just public pensions but among any defined benefit pension in the United States, is designed to share risks between participants and the state, through two key mechanisms. First, the contribution each year is recalculated as needed to keep the plan properly funded, and that contribution equally split between workers and the state. 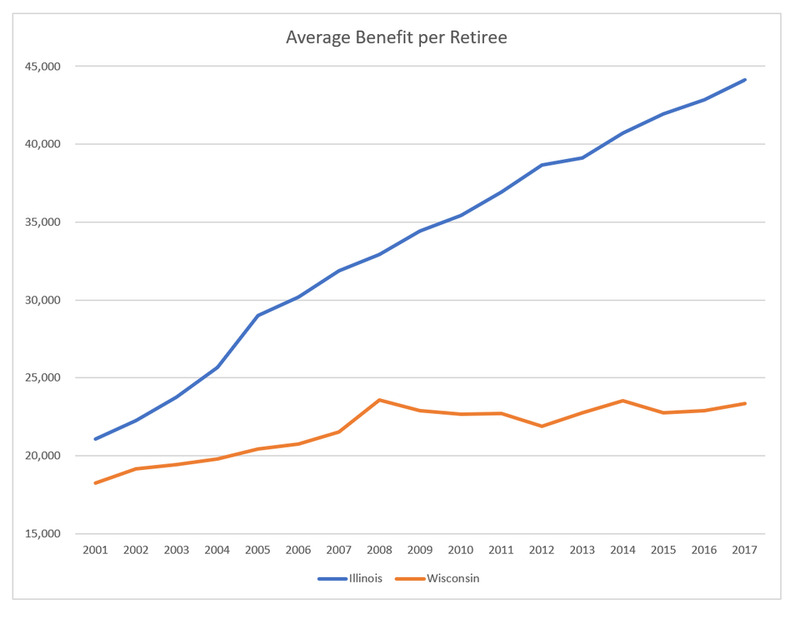 Second, unlike Illinois' retirees, who are guaranteed a 3% benefit increase each year, no matter what, Wisconsin's cost-of-living adjustments are dependent on favorable investment returns, and, far more crucially, retirees' benefits are similarly reduced in down years. 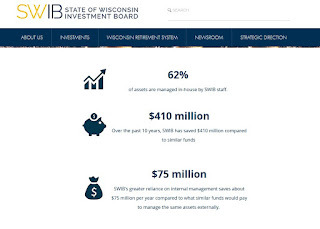 The gains and losses are smoothed on a five-year basis to reduce the impact any given year, but, despite fears by many retirement experts that, when it comes down to it, plan administrators would chicken out on benefit reductions, in Wisconsin, these benefit reductions really have been applied just as consistently as the benefit increases. What's more, the adjustments take into account not just investment returns but also mortality improvements and other plan experience/assumption impacts. Of course, the increasing plan contributions during this time frame, from 4.1% to 7.3% of pay, suggest that it's not all magic. And as the Journal-Sentinel reports, lawmakers succumbed to the temptation to boost benefits in 1999, and, as Campbell reports, they then resorted to a Pension Obligation Bond and its "beat the stock market" gamble, to fill a budget hole, which, again per the J-S, has worked out in their favor. Nonetheless, in my article earlier this week on the Aspen Institute's report on non-employer retirement plans, I wrote that they sought the "holy grail of retirement policy" -- risk pooling as a replacement for the risk protection that employer-sponsored retirement plans had formerly provided. 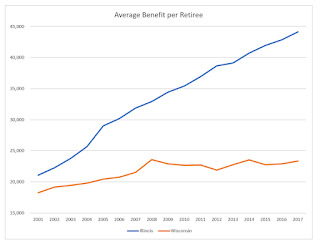 If we want to analyze prospects of risk pooling, collective defined contribution, defined ambition -- however we wish to label this sort of plan, there is no better place to start than the Wisconsin Retirement System. 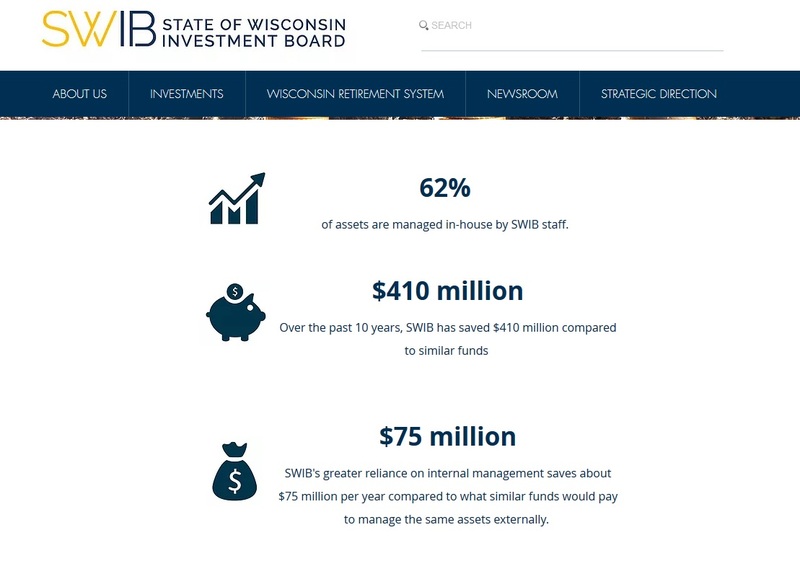 There's no doubt about it, while I'm very worried about most US public pension plans, Wisconsin Retirement System isn't one of them. Why? As the author states above, they have adopted a shared-risk model, including key elements which have led to the success of Canada's pension titans like conditional inflation protection. There are some states striving to do what’s right for all stakeholders. They just don’t get the amount of press that plans in crisis get. Fair point, reporters love to report doom & gloom on state pensions -- and to be sure, most are in dire shape -- but some are doing just fine, having adopted a shared-risk model similar to the ones Canada's successful large public have adopted so they can achieve fully funded status. Remember, pension plans are all about matching assets with liabilities. You can have the best investment managers in the world but if liabilities start soaring, mainly because rates keep declining, then your pension plan is going to be in trouble. I say decent, not spectacular, because, over a long period, it has basically matched the benchmark, but not added significant added value over the benchmark (it's basically all beta). I also like how transparent SWIB is in terms of its investments. You can see the full list for calendar year 2017 here, including investment partnerships. It also has public records on board meetings but no videos like CalPERS and CalSTRS. 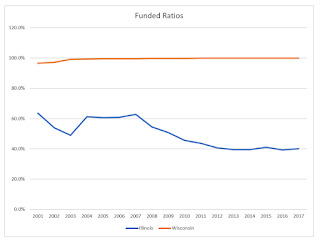 Anyway, the reason it's important to bring up the Wisconsin Retirement System is that it (and others like South Dakota) are obviously doing something right in terms of maintaining their fully funded status and that something right is adopting a shared risk model. In an era where defined-benefit (DB) plans are being attacked all over the United States, I think this is the standard all states should aspire to, not the silly things Kentucky and other states are doing or trying to do by cutting DB plans to replace them with cheaper defined-contribution (DC) plans (cheaper is a matter of debate when you add all the long-term costs and DC is definitely not better than DB). Below, Michael Williamson, the former Executive Director of the State of Wisconsin Investment Board, gave an excellent speech at the Milwaukee Rotary Club in August 2017 before he retired. Listen carefully to what he says about their exceptional funded status, the shared risk model and more. I also embedded another clip where Michael Williamson and others at SWIB discussed why they chose Citisoft for their technological needs. Lastly, let me share with you my favorite thing about Milwaukee. Giannis Antetokounmpo, aka the Greek Freak, recorded a career-high 52 points on Sunday (including a career-half-high 35 points in the 2nd half), with 16 rebounds and 7 assists as the 76ers defeated the Bucks in Milwaukee by a final score of 130-125. They lost the game but that dunk over Ben Simmons was priceless! I noticed in your column about Wisconsin that you are relying on the Public Plans Database. Unfortunately, it has Wisconsin's discount rate wrong. See page 148 of the 2017 CAFR. 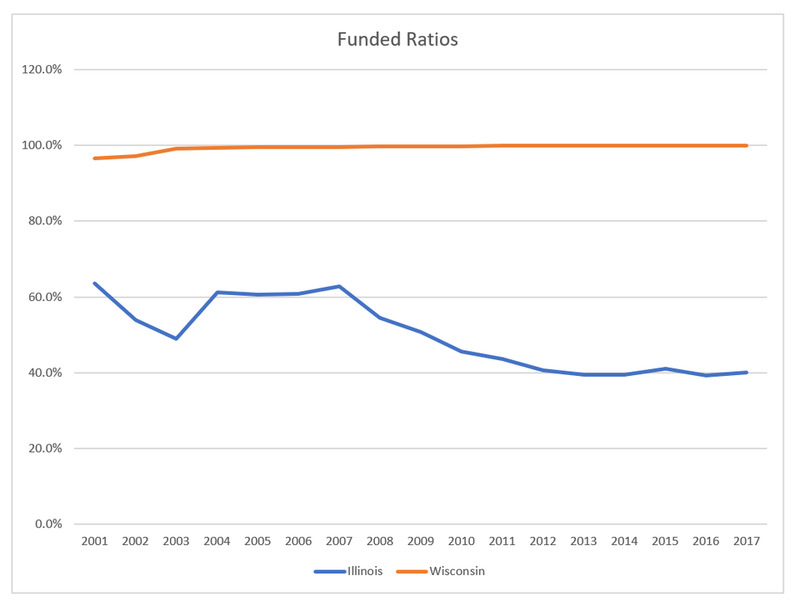 http://etf.wi.gov/about/2017-cafr.pdf WRS uses a discount of 7.2% for active employees and a discount of 5% for retirees, resulting in a blended rate of 5.5%. I believe that this is unique among American pension plans, and I have brought this error to the attention of the folks at Boston College. I guess the correction fell through the cracks. I thank Godon for sharing this information with my readers. Jim Keohane on 20 Years at HOOPP? Canadian Pensions Embrace New Technologies? PSP, QuadReal Invest in London's Cherry Park? More Bad News For Active Managers? CPPIB, OTPP Eyeing Indian Projects? BCI's Record $7 Billion Real Estate Partnership? Resilience According to Boivin and Letko? Caisse Invests in India's Financial Services? AIMCo Closes Acquisition of Eolia? Get Ready For a Bubble in Stocks?